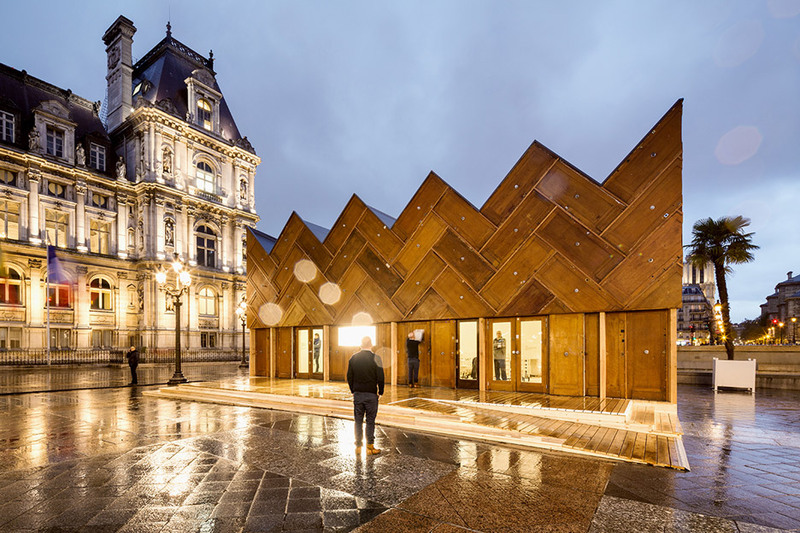 Architecture studio Encore Heureux has built a pavilion outside Paris‘ city hall featuring a facade made out of reclaimed doors and insulation recycled from an old supermarket roof. Installed last month to coincide with the United Nations Climate Change Conference, held in the city between 30 November to 11 December 2015, the 70-square-metre building is intended as a model for sustainable architecture. It is named Circular Pavilion – a reference to the construction approach rather than the shape. 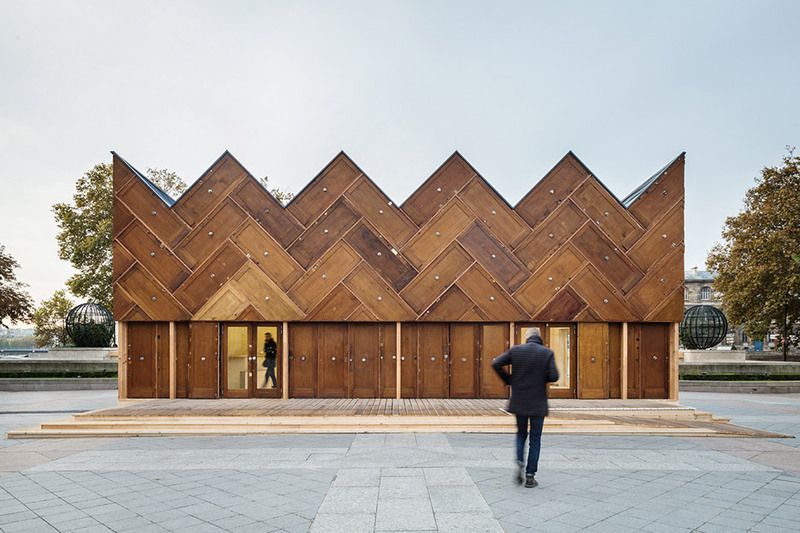 “The Circular Pavilion is a singular ephemeral building that has nothing round,” explained Paris-based Encore Heureux, whose projects also include a timber-clad cinema in the south of France. “The name describes the process that follows the circular economy principles according to which one person’s waste becomes another’s resources,” said the architects. The building’s most unusual feature is its door-covered facade. The architects sourced 180 of the oak doors from housing undergoing renovation in Paris’ 19th arrondissement. Rather than arranging them in a simple rectilinear grid, the team created a herringbone pattern around the upper sections of the walls. This gives the building a zigzagging roofline. “With this experimental process, we wanted to demonstrate that access to new material deposits relies on new relationships with the ones in charge of deconstructing and dismantling buildings, the ones who salvage and implement materials,” said the team. Mineral wool sourced from a dismantled supermarket roof provides insulation within the walls. 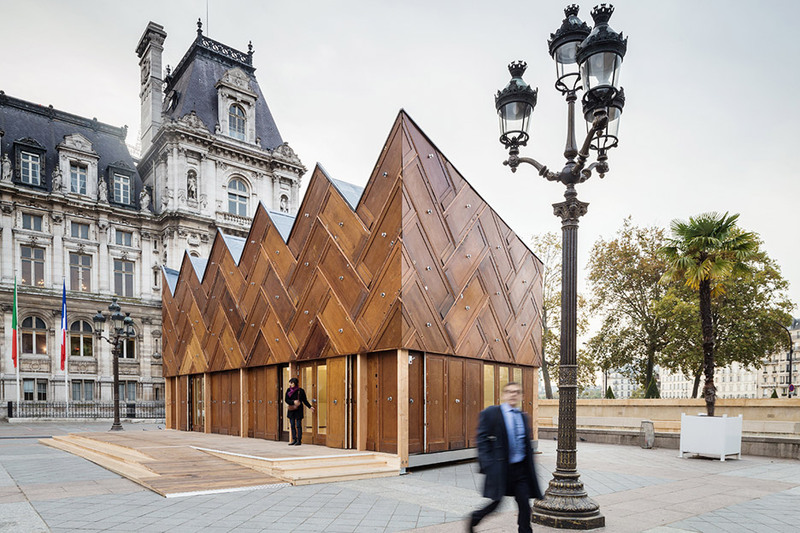 Other elements used include plexiglass mistakenly ordered by the city hall, plywood boards previously used for an exhibition, and oak battens leftover from an office construction project. Inside, the space is furnished with 50 reclaimed wooden chairs that have been repaired and painted, and recycled public lighting. “Each of the materials implemented has its own story,” added the architects. 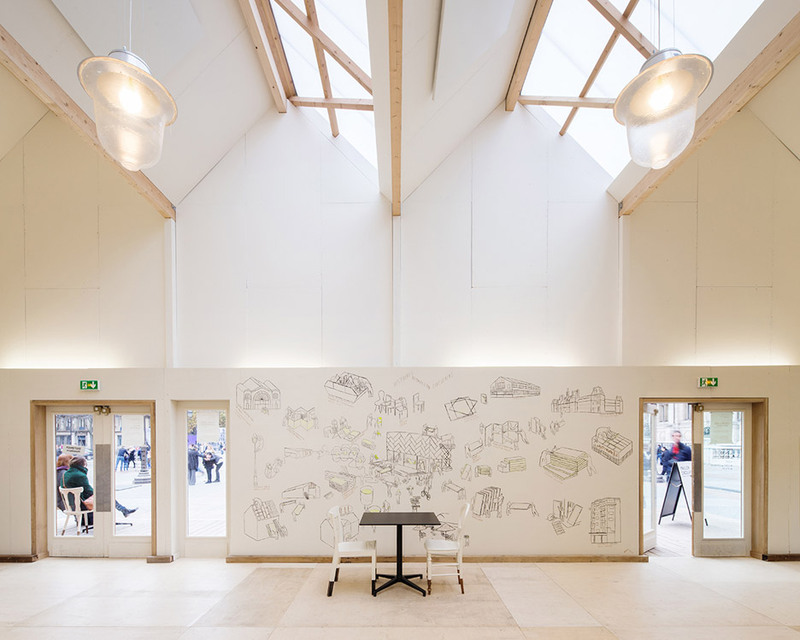 The Circular Pavilion is now being used to host a programme of exhibitions, workshops, lectures and debates. Early next year, it will be dismantled and relocated to the 14th arrondissement, where it will be used as a clubhouse for a sports association. Also to coincide with the COP21 climate change conference, Tomás Saraceno installed a pair of air-filled globes that could be developed into solar-powered vehicles at the Grand Palais. Adidas unveiled a concept trainer with an upper made using waste plastic filtered out of the oceans and a 3D-printed midsole created from recycled fishing nets. Photography is by Cyrus Cornut, unless otherwise stated.